Bluebell Cottage is over 200 years old and was built in the late 1700s in association with Masson Mills which is situated just opposite, on the other side of the road. The cottage enjoys cosy and attractive accommodation with 3 bedrooms, (a double, a twin, and a bunk bedroom), 2 bathrooms, a living room with log burning stove, and an appealing dining kitchen with pine table. The dining table seats 4 comfortably, and will seat up to 6 guests. The cottage is fully equipped for 6 guests. However it is also a lovely spacious retreat for just two guests! The bunk bedroom is best for kids, although the bunks are adult size. Free BT WiFi available. There is a cute and sunny cottage garden (not secure) with a small lawn and flowerbeds and outside table and chairs. The cottage is situated in a Conservation area within the Derwent Valley Mills World Heritage Site. Just opposite is Masson Mills which is open 7 days a week, and provides an excellent restaurant serving a good selection of meals, snacks, cakes, coffee, teas and soft drinks. The restaurant has tables which closely overlook the River Derwent. The restaurant offers a really good cooked Breakfast Deal! There are first class shopping outlets within Masson Mills, with a huge variety of merchandise, shoes, clothes, jewellery, china, bedding, giftware, kitchen items, foodstuffs, booze, etc. There is also a most interesting working textile museum. There are numerous country pubs, restaurants, and food outlets within walking distance. The cottage is ideally placed for using public transport, being off the main thoroughfare, yet within only 50 yards of a bus stop linking into services all over the Peak District. Trains run nearby from both Matlock Bath and Cromford, with links into the main rail network. Temporary Parking to load/unload passengers and luggage is possible right outside Bluebell Cottage. (The lane is awkward and narrow so parking there can only be for a short while) Longer Parking is available at the nearby New Bath Hotel. We have arranged with the manager for or guests to park in the hotel car park for £5 per day to include overnight parking, and access to vehicles is 24 hour. You can alternatively park at the Masson Mills Car Park which is conveniently directly opposite the cottage, for £5 per day which includes overnight parking (£2.50 of this charge is refundable on purchases in Masson Mills shops or restaurant). So great value! Only downside is that vehicles need to be parked up for the night by 5.30 p.m., and 5 p.m. on Sundays, as the car park is locked up between 5.30 p.m. and 7 a.m. Otherwise free unrestricted public Parking is available in Cromford village a short, less than 10 minute, level walk from the cottage. Well-behaved Pets are welcome. We are Judie and Patrick. I am originally from Surrey and Patrick from Yorkshire. Much of my childhood and early life was lived in Wales, and Patrick comes from an Irish family, but was born and has lived all his life in Yorkshire. His father was a doctor who came to work in Sheffield as a GP in the 1950s. I have also lived in Devon. Patrick and I have been together since 1982 and have one grown up son. I also have two older children who live in Essex and Germany, and who have provided me with three lovely grandchildren. I am a retired librarian, having worked in both public libraries and in the Arts, Film and Media section of Sheffield Hallam University Learning Centre. These days we are rather nomadic! We both enjoy travel, reading, Scrabble, crosswords, cooking and wine! For many years we had just adored Matlock Bath. My children loved the beautiful park, as now do my grandchildren, with its excellent playground, motor boats on the lake, miniature train, and putting. The park also includes a cafe, tennis courts, 18 hole putting green, bowling green, and skateboard tracks/jumps. We all enjoy the autumn 'Venetian Nights' when themed illuminated gondolas sail on the River Derwent.We love the location of Bluebell Cottage situated near Masson Mills, in the Derwent Valley Mills World Heritage Site. Being convenient both for the countryside and also all the fun and amenities of Matlock and Matlock Bath. We much appreciate the cottage being so ideally placed to link into public transport by both rail and bus, making it an ideal choice for a car free holiday. 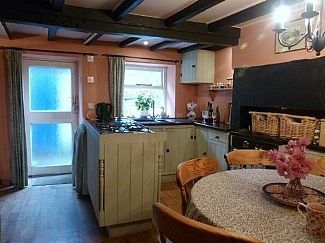 Bluebell Cottage offers a characterful atmosphere with beams and nooks and crannies and yet provides all modern conveniences. Having 2 full bathrooms is an asset not often found in a cottage of this size. Masson Mills just opposite provides an excellent self-service restaurant overlooking the River Derwent, interesting shopping outlets, and a working textile museum. There are literally country walks possible from the front door. Many attractions are within easy striking distance such as Bakewell, Chatsworth House, Haddon Hall, Hardick Hall and Buxton. Plenty of pubs, restaurants and food outlets, and interesting shops, are within easy walking distance. Free reliable BT WiFi is available at the cottage and the TV has BT vision enabling recordings/catch up TV. toilet, tub, Wash Basin. Bath has a shower attachment to the taps. First floor bathroom with bath, electric shower, wash basin and wc. Second floor bathroom with bath, shower attachment, wash basin and wc. Beamed living room with comfortable seating for 6, log burning stove set in original grit stone surround, TV/DVD player, music system, door opening directly to footpath leading to woods and country walks. Neff electric oven, neff gas 4 burner hob, microwave oven, fridge/freezer, dishwasher, washing machine, toaster. Table seats 4 comfortably, but will seat 6. Note:- Baby chair with tray which straps to dining chair needs to be reserved. Small cottage garden with table and 6 chairs. Not secure for young children or pets without supervision. A few stone stairs to access. Notes on accommodation: The cot and high chair are shared with our other properties so please request them if required. Ample nearby free unrestricted parking always available (400 yards). Temporary parking to unload/load passengers and luggage is possible beside the cottage. (It is a narrow access lane). Outside: There is a small sunny cottage garden with lawn and flowerbeds, with a table and chairs for 6 provided. Off season there are views over the Derbyshire Hills, but these are obscured by trees during the summer months! Utility Room: Iron, ironing board. Cleaning / Towels / Linen / Maid service: Bedlinen and towels are provided. The cottage is thoroughly cleaned before the arrival of new guests. Towels are linen are changed if guests are staying more than 7 nights. Other: Well planned dining kitchen with round pine dining table and six pine chairs. Well equipped kitchen. Only a short stay but loved the cottage and it's location. A couple of great walks from the doorstep and fun evening doing the quiz at the boat inn. Very friendly place and happy with the dogs too. The owners were very honest about the parking and stairs. They were no trouble for us at all. Would definitely go back. This is a very old charming cottage. It is in walking distance to Matlock Bath, which the children and I enjoyed. The price was good for the quality of the cottage. Judy left milk and biscuits that the children consumed within the hour. The top floor had the only full bed. My husband hit his head several times on the ceiling. We could not get a breeze and the top floor became a little warm. Others had mentioned that there was an odor in the cottage. It did have a smell. The area is beautiful. I would just like to clarify the 'smell' which the reviewer referred to, as I would hate to think that readers might think it meant a whiff of drains, old cabbage, or fried onions! The cottage is very ancient and does have a slightly musty aroma, particularly in wet weather. Another point to mention is the only 'full' bed. It means the only double bed in the cottage. The other beds are full sized singles in the twin bedroom, and adult sized bunks in the smaller bedroom. The top floor does have low ceilings and could be a problem for taller guests, though most seem to accept it as adding character and don't mind coping with a low ceiling. 'Bluebell Cottage', Matlock Bath, in the Historic Derwent valley. A most Pleasant 3 night autumn stay, in this period/character accomodation in the picturesque Town of Matlock Bath ~ A Highly recommended base for any visitor/tourist to the Peak District area. Julie, the owner being a very trusting & amiable letting host. ideally suited for the more younger peaple as all bedrooms are situated upstairs up some narrow stairs. There are two floors each with bedrooms and bathrooms, both nicely done out. clean bedding on arrival. Teddies and chocs were a nice touch. slight concern over amount of cobwebs within the kitchen/dining area, might be the age off the building or the cleaning schedule. Cottage ideally placed for matlock baths, easily walkable without the hassle off trying to park, unfortunately you have to work out where to park at the cottage first. One night we parked outside as we came in late and told the occupying neirbours, the rest we parked over the road at £5 per night day, and managed to retrieve the car when we required . Good location for many local attractions. Cottage small but cosy. Well equipped kitchen. WiFi, BT TV along with Netflix. So plenty to entertain the children. Great places to visit within walking distance. Good situation for using public transport. Bus stop 50 yards, linking in to services all across Derbyshire. Matlock Bath and Cromford train stations within a couple of minutes drive. Bluebell Cottage is situated on the edge of scenic Matlock Bath and within 5 minutes walking distance of Cromford Village. Matlock centre is 2 miles away. Peak District towns and villages such as Bakewell, Buxton, Baslow, Hathersage, Eyam, and Castleton, are all easily reached by car or bus. The nearest general store is Arkwright's in Cromford (5 minutes walk) which is virtually open all hours! There are numerous pubs, take-aways, and restaurants close at hand. With something to suit all tastes, a really top class Indian restaurant, Thai, Chinese, Italian, Bistros, etc. Loads of fish and chip shops too, and plenty of cafes and ice cream parlours. There is a large useful Sainsbury's supermarket and garage in Matlock. Matlock provides for all general needs, with Tourist Information, a really lovely flowery park with tennis, putting, skate boarding, and an excellent children's playground with boating lake and miniature train, and a smart park cafe. There is also a P.O., banks, Boots, Co-Op, launderette, and numerous shops, etc. A great attraction at weekends from the end of August until the end of October are the famous and historical 'Venetian Nights' when illuminated themed gondolas sail along the River Derwent. Booking Notes: Bookings are agreed online or by phone. Payment is made by cheque sent in the post, or by bank transfer. Payment can also be made by using PayPal, but this incurs a small charge. 25% is requested to secure a booking, with the 75% balance payable 2 months before the holiday start date. Changeover Day: Changeover days are flexible to suit the needs of our guests. Notes on prices: Minimum let 2 nights, except a 7 night minimum at both Christmas and New Year. 2 nights from £199 - £299, depending upon the season.